If, while on your motorbike, you suffer an injury in an accident as a result of the negligent actions of another road user, a negligently placed hazard in the road or due to a poorly maintained road surface then you may be entitled to claim compensation. We have the knowledge and expertise to make sure you recover the compensation you deserve and to which you are entitled. 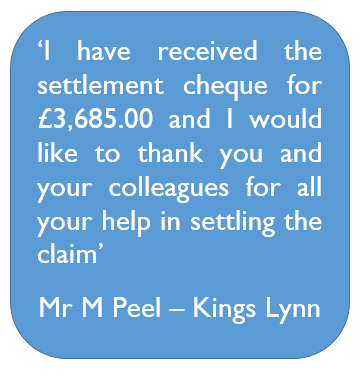 Your claim can be dealt with on a No Win-No Fee basis so there is no financial risk to you should you be unsuccessful in your claim. In addition to claiming for your injuries we will also recover all and any financial losses you may incur. The cost of repair or replacement of your bike as well as any damaged clothing/leathers or helmet. Loss of income as a result of time away from work to recover, or for treatment. The cost of any medication or treatment that you may require. It doesn’t matter if the treatment is available on the NHS you can still recover the cost of private treatment from your opponent’s insurers. Professional care costs if required. Care received from family and friends. If your injuries are severe enough to require help from non-professionals you can recover compensation for the help received regardless of whether you have paid for it. This is known as ‘gratuitous care’ and can be an important part of your claim, especially if your injuries leave you incapacitated for any length of time. Travel costs incurred for treatment or examinations. Adjustments and improvements to your home and car if so required. Motorbike accidents can result in serious injuries requiring long periods of rehabilitation and treatment. We appreciate this and therefore consider all aspects of your injury. We make sure that if you need treatment then that will be our priority. We will liaise with the other side’s insurers to make sure that this is arranged as soon as possible. Also, we know that money can be an issue if the main breadwinner is not able to work. We will therefore whenever possible look to obtain interim payments pending the final settlement of your claim. You have three years from the date of the accident (your 21st birthday if the accident occurred before you were 18) to institute court proceedings, however the sooner you bring your claim the better as evidence can disappear and witnesses recollections can fade causing problems when you do bring your claim.